ATC’s are just not my forte. I keep trying but I’ve never been quite happy with the finished results. The Cracker Jack Stamper’s that I’m part of have been swapping ATC’s recently and every time the sign up sheet comes around I swear I’m not going to participate again, but when that paper lands in front of me I pick up the pen and sign my name once again. 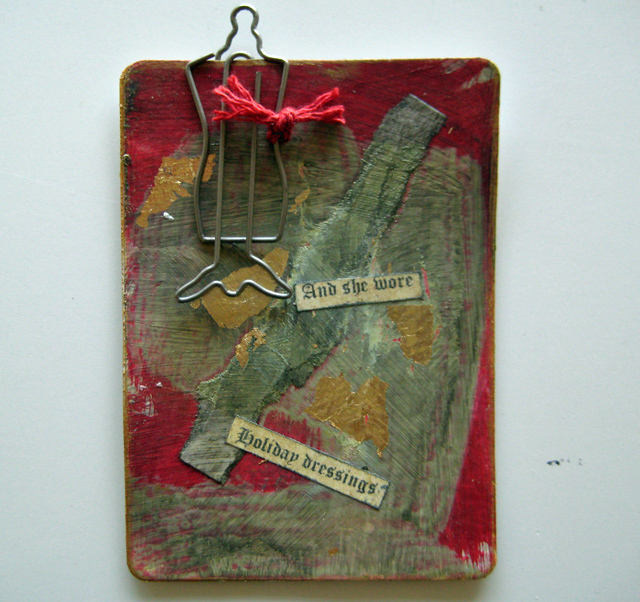 These are my attempt at a holiday-themed ATC for this months’ swap. I’m not afraid to show my failures! 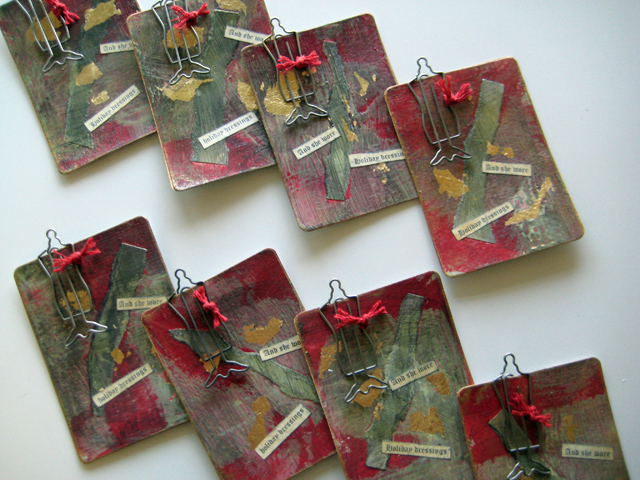 They started out as watercolor paper die cut with Tim Holtz’ ATC die. I needed eight so cut 16 pieces – front and back. 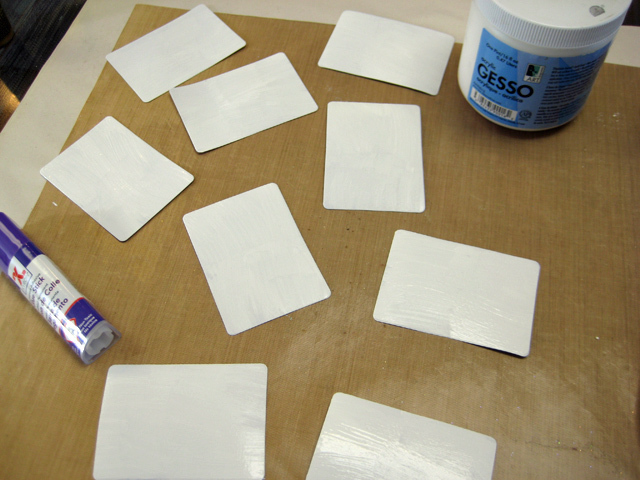 They are brushed with one coat of Gesso and left to dry. 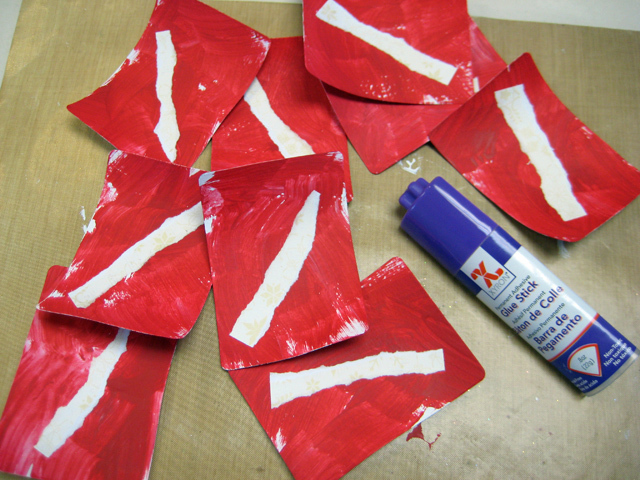 Then they’re painted with red paint and left to dry before adhering a torn strip of patterned paper with a Xyron Glue Stick. A thin coat of soft gel medium, colored lightly with a touch of black acrylic paint to make a tinted glaze, is brushed on. 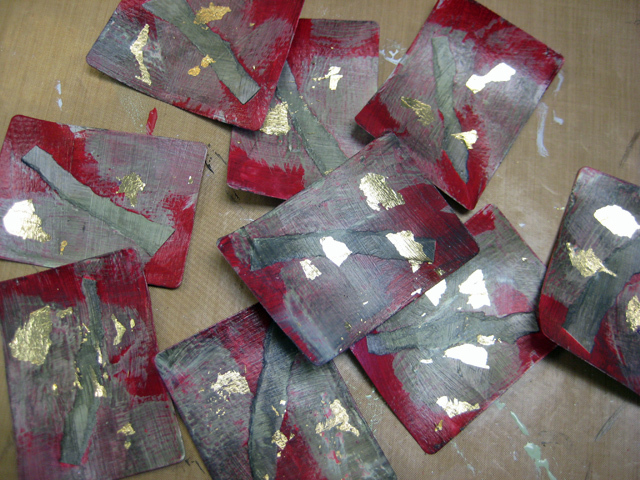 While the medium is still a little tacky I randomly pressed down some gold leaf to add a touch of bling – it is the holidays after all! I typed up a saying – “And she wore holiday dressings” and printed it out on plain office paper. 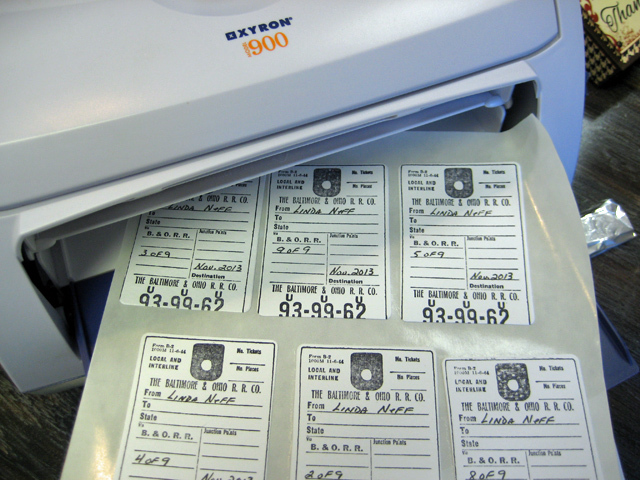 I trimmed the sayings down and inked the edges with Ranger’s Archival Black ink before running them through the Xyron 1.5″ Create-a-Sticker. 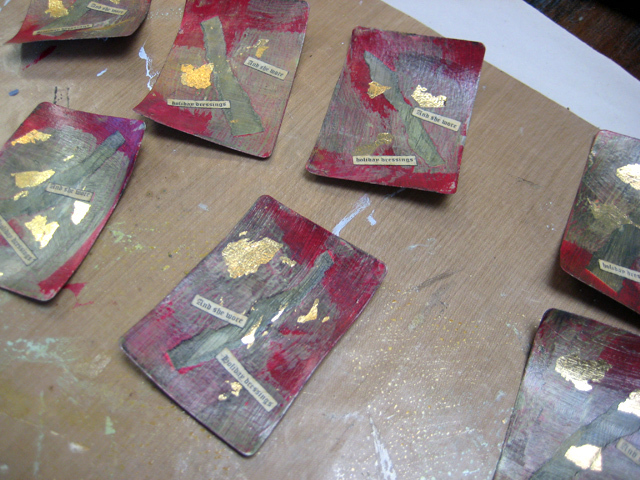 The saying is split and adhered to each ATC then the ATC’s are brushed with a thin layer of soft gel medium tinted with Ranger’s Adirondack Metallic Gold paint dabber. I used a baby wipe to blot and gently wipe away some of the gold layer; I wanted just enough left to add a slight sheen. I prepped eight Dress Form Hangers from Maya Road by tying a piece of Maya Road Twine Cording around each one and trimmed the ends. 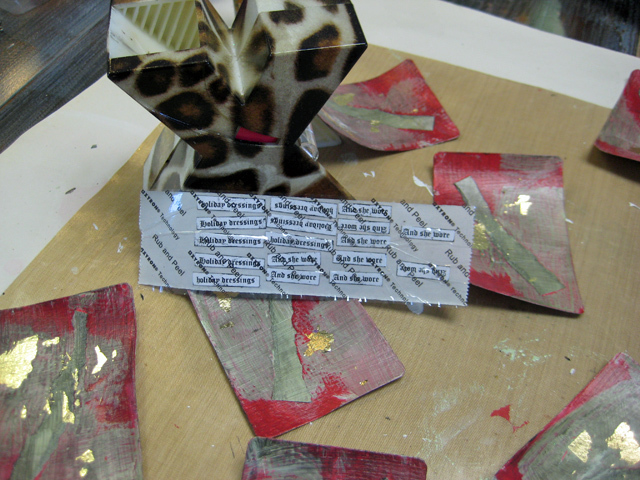 To complete the look, I stamped the other eight blank ATC’s with a label stamp, wrote my info on the back and ran them through the Xyron 9″ Creative Station. Then I matched them back-to-back with the finished fronts. I finished them off by edging them with the gold paint dabber and added the cute paper clip! I took them to Club and exchanged them with the others. Though I don’t love them I’m not ready to give up yet! I love a good challenge so keep watching for that perfect ATC from me! 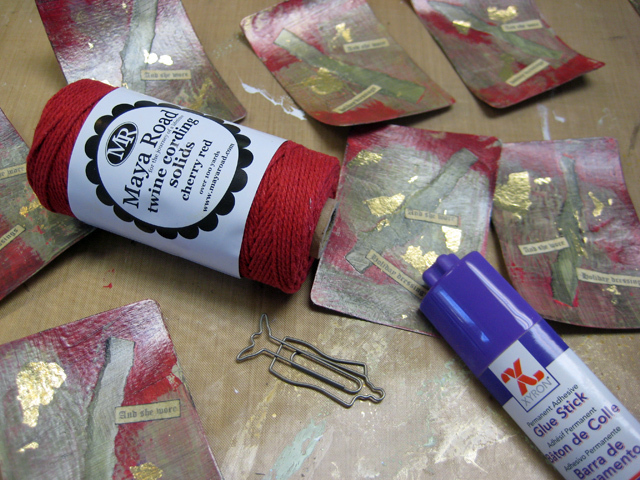 These ATCs are very festive, even more so in person! Thanks, Linda!! !